Maz Jobriani reads his hilarious and moving memoir of growing up Iranian in America, and the quest to make it in Hollywood without having to wear a turban, tote a bomb, or get kicked in the face by Chuck Norris. When he first started out in show business, Maz Jobrani endured suggestions that he spice up his stand-up act by wearing “the outfit,” fielded questions about rising gas prices, and got called an F’in Eye-ranian for being involved in the Iran hostage crisis even though he was only eight years old at the time—in fact, these things happened so often that he began to wonder: Could I be a terrorist without even knowing it? Having emigrated with his family to the US during the Iranian Revolution, Maz spent most of his youth desperately trying to fit in with his adopted culture—whether that meant learning to play baseball or religiously watching Dallas with his female relatives. But none of his attempts at assimilation made a difference to casting directors, who only auditioned him for the role of kebab-eating, bomb-toting, extremist psychopath. 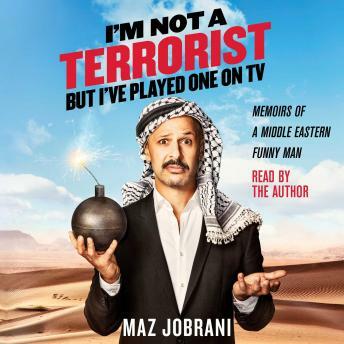 In this laugh-out-loud memoir, Maz shares his struggle to build an acting career in post-9/11 Hollywood—from playing a terrorist on 24 to playing a terrorist opposite Chuck Norris to his mother asking, “Vhy you alvays terrorist? !” (Followed by, “Vhy you couldn’t be doctor? !”) But finally, through patience, determination, and only the occasional unequivocal compromising of his principles, he found a path to stardom. And he also learned the proper way to die like a bad guy on TV.